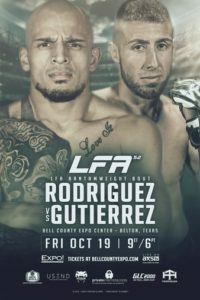 LFA 52 takes place at the Bell County Expo Center in Belton, Texas, and is headlined by Ray “The Judge” Rodriguez against Chris “El Guapo” Gutierrez in a Bantamweight affair. Rodriguez a San Antonio, Texas, native on a 8 fight win streak. 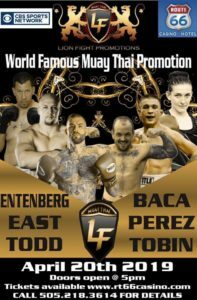 “The Judge” has fought once for Legacy Fighting Alliance taking a split decision win over Rivaldo Junior at LFA 6. During this current win streak, Rodriguez has scored 6 finishes, including a Combate 19 TKO win over Michael Rodriguez. Gutierrez hails from Greenville, Texas, and has won 2 in a row, a split decision over Mario Israel at LFA 22 & a TKO of Jimmy Flick in April. “El Guapo” has scored all 6 of his finishes by knock out.